Weather and foot traffic (of both people and pets) take a toll on backyard decks. A construction contractor interviewed for a deck restoration project with This Old House said, “I’m sometimes asked to replace pressure-treated decks that are less than 8 years old. Most of these decks are victims of neglect. 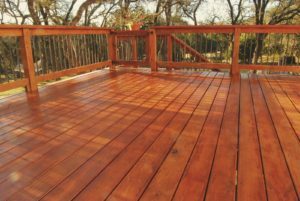 With regular maintenance, a deck will easily last for twice as long.” Extend the life of your deck by hiring Paint Pals of Fort Collins to professionally restore and protect it with our effective deck staining process. Repair– A thorough inspection checking for both cosmetic and structural damage is the first step in deck restoration. Close attention should be paid to the connection between the deck and house as well as the supporting posts and joists. Look for rotted wood, loose or rusted screws, bolts or flashing, and black stains that indicate mold growth. Clean– An annual cleaning is essential to keeping your deck in prime condition. A pressure washer with a fan nozzle works best for resistant stains. Depending on the type of cleaner used, nearby plants will either need to be washed before and after cleaning or covered in plastic for protection from harsher chemicals. Seal– Using a semitransparent stain makes new wood blend in while the pigment helps protect the deck from UV rays so it will last longer than clear finishes. A second coat should be applied while the first is still damp for proper absorption. To keep your deck looking its best, alternate between applying a new coat and a water repellent every other year for the ultimate protection. Spring is an ideal time for a deck staining project so you can enjoy the warmer weather and greener landscape in the months ahead! Call Paint Pals of Fort Collins today for a free estimate- you will be impressed with how affordable and quick our deck staining service is, and we guarantee your total satisfaction.